NEW YORK -- The rumor started late Thursday afternoon. 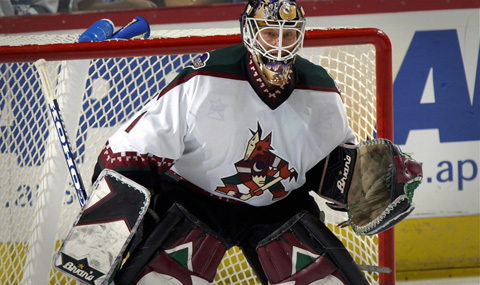 Ilya Bryzgalov was ill and the Coyotes were looking for a backup goalie for their game that night against the New York Rangers at Madison Square Garden. And, just to amp things up for those of us in the business of telling stories, the early leader in the clubhouse for the gig was Coyotes Goaltending Coach Sean Burke. Our Fox Sports Arizona broadcast crew was preparing graphics and video in support of this event. I was already dreaming of my second period bench interview with one of my all-time favorite players and people. I think in some way I wanted to live this moment through him, vicariously. That’s what I dreamed up. Burke, who retired in 2007, got on the team bus from the hotel in Times Square and for a split second I swear he was about to walk to the BACK of the bus. If he did, that was the confirmation. But he stopped, turned and took a seat two rows in front of me. That’s where the coaching staff sits. Still, he had a coffee and was on his phone. I wondered. Alas, it was not to be. Because he had pro experience he would have to clear waivers and that’s takes 24 hours. Sean Burke was ready to fill in, but his return to action wasn't to be. “I was ready, Bud,” he texted me. But who gets the nod? Al Montoya? Matt Climie? They were in San Antonio. Since the Concorde went out of commission a few years ago, this was a geographical impossibility. They were in Texas. injuries is about all I can ever say these days. Play-by-play voice Dave Strader was telling some great stories about moments like this that he had witnessed along the way. And, it is not uncommon. Here’s a link to what happened just last year in Washington. Soon, we had a name. Who was this guy? Must be from the Iron League, right? Tom Fenton takes the ice. So THIS is Tom Fenton. But there had to be more to his story, this story, and there was! We tracked him on our Qwest Coyotes Live Pre-game show during warmups. Shot him on the bench. And, as the Coyotes raced out to a 2-0 lead we made the call. We had to talk to Fenton between periods. Only one problem, Al Trautwig of MSG was thinking the same thing. In our broadcast world we have the right of way as we are the Coyotes flagship station. But, Phoenix was coming off a miserable loss the night before in New Jersey. Head Coach Dave Tippett challenged the leaders of his team and it was looking like they were responding. The game was a bigger story. Fenton could wait. But the iron was hot. I thought of the late great Howard Cosell as he was given a similar question while hosting halftime of Monday Night Football back in the day. Then California Governor Ronald Reagan was in the house, but so, too, was John Lennon. “I’ll take the Beatle,” Cosell said. “I’ll take Fenton,” I said to Nairn. His eyes got wide, he looked at me and shook is head. It reminded me of when your buddies pull a prank or do something over the top and just keep pouring it on. You can’t stop it. It’s like a wedding. It just keeps happening. Tom Fenton gladly answers questions during the first intermission. And there we were, waiting for the camera to focus to talk for 90 seconds. That’s it. Maybe more. Maybe less. We have a link to the interview. I think I was happier than he was to talk about it. Trautwig would get his time with Fenton in the second intermission. I shared with him during the second period that Tom told me that he was getting his haircut when he got the call from the NHL. Al just looked at me like I had rocks in my head. So, for the record, between periods last night of the Rangers-Coyotes game, on Fox Sports Arizona and on MSG, the immortal Tom Fenton did not one, but two in-game interviews. We continued to track his story throughout the game. Shane Doan told me between the second and third periods that the Coyotes were trying to get him on the score sheet. We found out later that in the spirit of the NHL a grand practical joke was played on Fenton. He was told that it was a league rule that he must keep his helmet and facemask on at all times. He did. If it were me, I’d still have it on this morning. Maybe even all weekend. It wasn’t appropriate to drag Fenton into the interview room after a loss like that. We told his story and put a bow on it in-game. I won’t soon forget the swarm of New York media assembled by his stall in the locker room. I did talk to him, Coyotes Assistant General Manager Brad Treliving, who made the call to get him here, and goalie Jason LaBarbera. Click here to listen. I have worked on just about every Coyotes game that this franchise has ever played. There are memories to last two lifetimes. 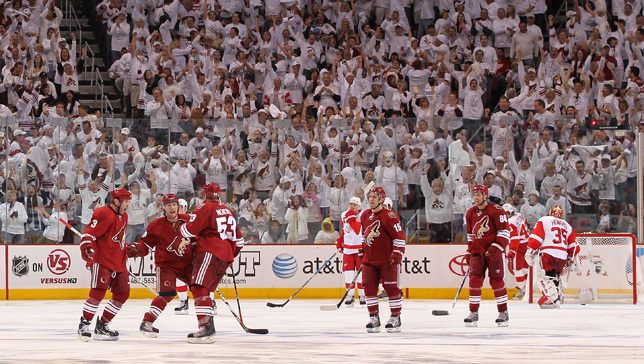 The White Out of 2010. I remember Opening Night at America West Arena, the first White Out, and of course, the most recent White Out. We helped sell and market tickets to seats that had an obstructed view of the ice. Later, we stood in front of the grand opening of a brand new arena one windy night on the “West Side.” Who knew what the future would hold then. Brian Boucher’s shutout streak is the gold standard for memories. We followed Wayne Gretzky. Ponder that for a few moments. High profile personalities like Jeremy Roenick and Keith Tkachuk once dotted this landscape. So, too, did Rick Tocchet. The life and times of the one and only Shane Doan are still front and center. Last season’s remarkable journey is in so many ways still on going, so I can’t begin to process it just yet. I do know that it starts in a court of law and doesn’t end in Winnipeg. Parris Duffus used to be the answer to my favorite Coyotes trivia question. I won’t spoil my competitive edge so I won’t give you the question in the event that I might need to grab some walking around money from you. 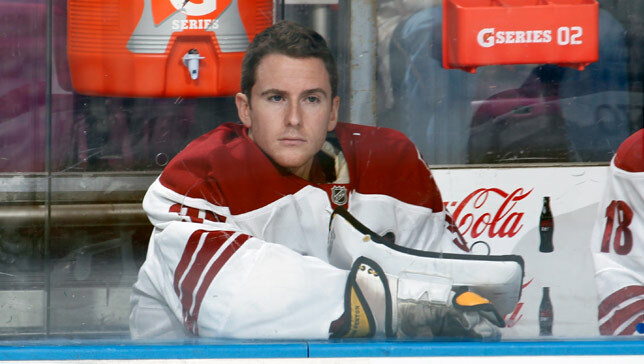 Tom Fenton soaks it all up from his seat on the Coyotes bench. But now we all have the story of Tom Fenton and his Walter Mitty moment. And for any of you who have ever spent one minute of your life on an athletic field of competition you know why this is such a cool story. And for those of you goalies who didn’t answer the phone on Thursday because you didn’t recognize the 480 area code, I really hate to tell you this, but it was Brad Treliving and he was about to ask you what your plans were for the evening and if you might have some time. The National Hockey League was calling. 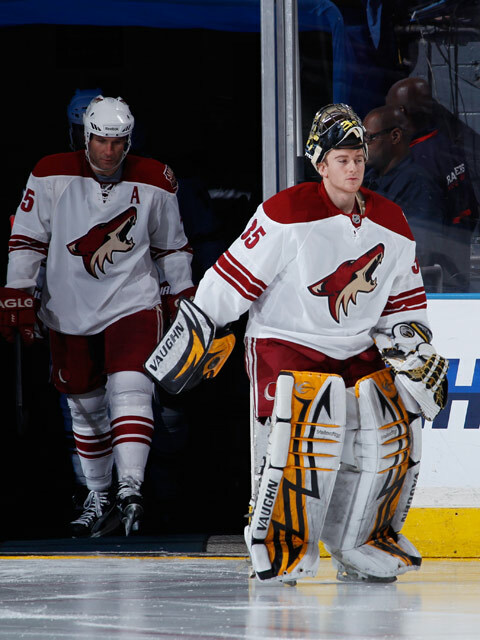 The Phoenix Coyotes needed a backup goalie for their game at Madison Square Garden in a few hours. They can’t pay you, but you get to warm up, sit on the bench, and Head Equipment Manager Stan Wilson will ensure that you get to keep the jersey. After all, your name will be sewn on the back of it. 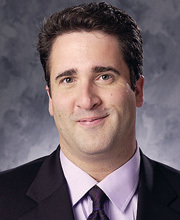 And if Jason LaBarbera gets hurt… well, never mind.